Put down the dumbbell. And the medicine ball. Hang up the ab mat. You might be in the gym to tone up or decided to lift weights to improve your strength. However, the fitness accessory you might be missing is nowhere near the weight room. Studies have shown that aquatic exercise can make you stronger and more powerful. Whether you have physical challenges to overcome or a serious athlete, water-based programs can deliver an effective workout like one on land. Or, maybe even better. Water has a natural resistance built in, meaning that your muscles will benefit from the most basic of moves. There’s a drag to the water, and you’ll feel it if you lift your arms from your sides to shoulder height. Picture it: You are standing in a swim spa from Master Spas, and you can feel the pressure of the water on your forearms as you raise them to the surface. It’s work! Good work. The resistance of the water varies on the speed of the movement but it can be between 4 and 42 times greater than in air. It’s like a weight machine that you don’t have to change the settings. This makes water a natural and instantly-adjustable weight-training machine. Plus, the water allows you to move freely. When you exercise in the water of a swim spa, you can have increased range of motion and increase the effectiveness of the exercise. 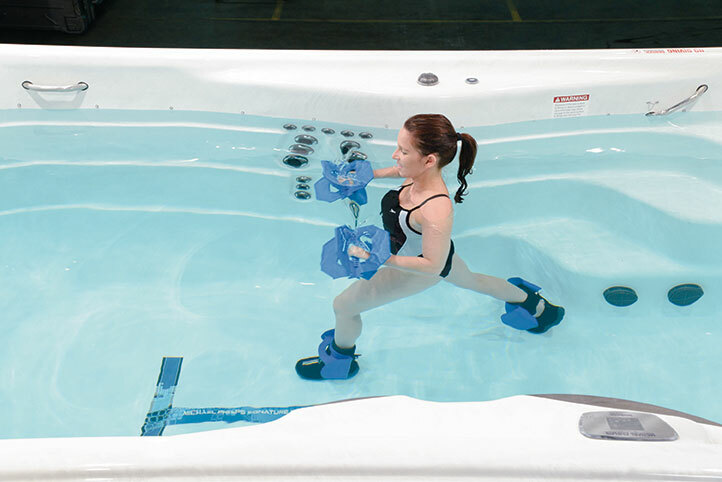 Many studies have looked at the benefits of aquatic exercise, from how it can help people with chronic conditions to recovering from an injury. Research has shown that water exercise, like that in a swim spa, can improve strength, muscle power, VO2max, flexibility and body composition. People can also do plyometric exercises in the water, like a tuck jump or jumping jack. In one study, female volleyball players improved jump performance doing such exercises in water. Fins, dumbbells, resistance bands and rowing bars. 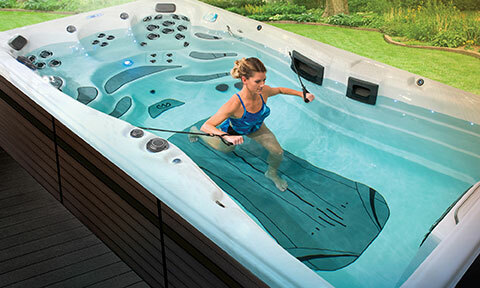 There’s no equipment required when you exercise in a swim spa from Master Spas. But, you can mix it up with water exercise equipment and accessories. The H2Xercise Fitness System comes with the items you need to take advantage of water’s resistance. The gear is designed to help make your swim spa workouts more effective and make you stronger. Strengthen your hips and glutes with leg extensions. The water helps you have more mobility, increasing the effectiveness of the exercise. Add fins to increase the difficulty. The H2Xercise Fitness System also comes with a guide written by Dr. Rick McAvoy, a physical therapist and water fitness expert. It’s a comprehensive guide to the moves you can do in the water. Exercises vary from beginner aquatic workouts to intermediate and advanced programs. Here are some of our favorite moves for getting stronger in the swim spa. Stand tall, take a big step forward with one leg and start so heel hits the floor first. Lower body until thigh is parallel to floor and shin is vertical. Press into heel to drive back up to starting position. Repeat. Hold side of swim spa, stand on one leg. Lift leg forward and then backward, keeping knee straight. Do not rock body. Repeat. Hold blade loose, keeping wrists straight. Stand with feet shoulder width apart and knees slightly bent. Stabilize core, then open and close blade equally performing fly motion. Repeat. Split stance pulls help improve your upper body strength and posture. Hold X-blades loose, keeping wrists straight. Put feet in staggered stance position with knees slightly bent. Stabilize core, then push and pull blades equally. Repeat. For more information about exercise programs in a swim spa by Master Spas, click here.